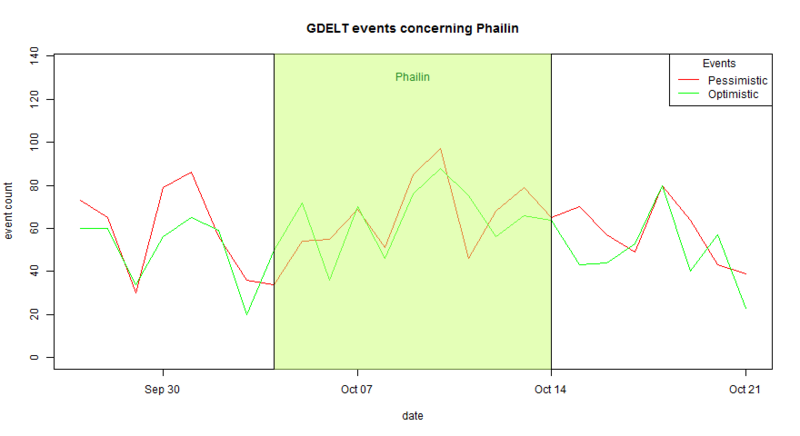 In exploring the GDELT dataset around disasters, I found an interesting trend around the tragic Typhoon Haiyan. Looking at events geolocated in the Philippines before and after the typhoon, I found a steep rise in the number of optimistic comments, clearly overtaking a rise in the number of pessimistic comments. This is just a probing of the GDELT data, which already must be used cautiously, so no conclusions should be drawn. It does suggest possible questions that we can ask about politics and psychology around disasters. More broadly, it raises some other ways to use the GDELT dataset. Oh, and as a quick comparison, there is no clear trend for optimistic / pessimistic comments in India surrounding the destructive but much less deadly Cyclone Phailin.